In late 1780, the American commander-in-chief of the southern theater, Nathanael Greene, made the daring decision to split his already limited number of troops in the face of a superior force under British Lieutenant General Charles Cornwallis. Accordingly, part of Greene’s force was given to Daniel Morgan. The British saw Morgan’s troops as a threat to some crucial posts, so Cornwallis sent troops under up-and-coming commander Banastre Tarleton to take on Morgan. When word reached Morgan of Tarleton’s approach, he decided to face his enemy in a cow pasture called Cowpens rather than risk being overrun while trying to cross the Broad River. Knowing Tarleton favored frontal attacks, Morgan deployed his infantry troops into three lines—meant to exhaust the energy and resources of the British—with his dragoons positioned in reserve behind the third line. When Tarleton’s men arrived, they were met by fire from riflemen in Morgan’s first line, who after a few shots withdrew to join the second line, composed of militia. Morgan had instructed the militia to fire two volleys at the approaching British and then retire, which they did. Seeing the American militia appearing to flee, Tarleton sent dragoons after them, but they were met by the American dragoons, led by Lieutenant Colonel William Washington. The British infantry had been stunned by the fire from the American’s first two lines and now faced the third line, predominately composed of experienced Continental troops overseen by Lieutenant Colonel John Howard. Meanwhile, Tarleton sent his reserve infantry and additional dragoons to try to outflank their opponents on the Americans’ right. The Americans on that side were commanded to turn to face the British, but the order was misunderstood, and they instead began marching to the rear, triggering a retreat in neighboring parts of the line. The confusion was corrected, however, and they turned to face the British in time. Those Americans were joined in the fight by the militia of the first and second lines, who had circled around the back of the American position. Morgan‘s near-genius plan worked, and the Americans decimated the British. Although the two forces were relatively evenly matched, with roughly 1,000 men each, the British sustained 110 killed and 830 captured or wounded, while the Americans had 12 killed and 61 wounded. The battle wiped out nearly all of Tarleton’s force, striking a serious blow to Cornwallis’s army. Did you have an ancestor who fought in the Battle of Cowpens? Tell us about them! Or learn more about the battle on Fold3. 2 of my grandfathers last named Fitzgerald and Hight fought in the battle and served under William Washington in the 3rd light dragoons. The battle wasnt long after FItzgerald was bayonetted 18 times in new jersey and was released from hospital in fredrick md. An ancestral grandfather fought there, Col Cowan. His home is still standing in NC and on the national historic registry. Apparently I had between 3 and 5 ancestral grandfathers who fought in this action, still validating their areas of service but know for sure 2 did. Joshua Dinkins was a fife player and teamster driver. He is on my Mothers father side. Col Cowan my Mothers mother side. Looking for a Josiah Cowan, probably from NC who fought in the Revolution. My ancestor, Captain William York from Randolph Co., NC gave only one son a middle name – his name is Josiah Cowan York and I hoped that would lead me to his mother’s family – or at least answer some ?’s about their background. My ancestor, William Crow, fought at Cowpens as part of Pickens’ Brigade. Yes ..he inlisted in the six regiment On June 27th 77…served in Pickens brigade after Charleston fell…Gen. ANDREW PICKENS….THE WIZARD OWL…….the Indians called him! I have Crow ancestors that were located in North Carolina. I’m wondering if your William Crow could be an ancestor of mine. The earlies Crow that I have information on is Charles Crow, b. 1717. Can you let me know if you think there is a connection? I didn’t see my original remark so I must have made a mistake so I will leave a shorter message: I had numerous ancestors at Cowpens. William Ruben Briant was my 4th ggrandfather. he was under Robert Andersons command at Cowpens. Prior to that he fought with Col Buncombe from 1776-1778. in the N.C. Continental Army. He returned to S.C. and fought in S.C. Militia. My 5thggfather James Dillard was at Guilford’s Courthouse and was in French and Indian War. His first cousin was at Cowens with same name James Dillard and his brother John Dillard. Dillard, Georgia is named after. My mother’s ancestor’s were mainly from S.C. Spartanburg and Polk county N.C.
DRAKE is one of my ancestral lines. Robert was born in 1777 in NC. There are many first names of Dillard through several generations of Drakes. Thus far I haven’t a clue except the town in Georgia and the department store. I’m looking for a Dillard and Drake connection. Can we correspond? Thanks! John Blackwell is one of the founders of Green Creek Baptist Church in the southern most area of Polk County, N.C. It was founded, I believe in 1795. He owned land near there. There are many people at that church who are related to him. He was a Baptist minister. He and his brothers ( who all fought at Kings Mtn and Cowpens) became Baptist ministers, as I have been told and circuit road the North Carolina panhandle to all the area churches. John stayed at Green Creek Baptist. His sons migrated to North Pacolet area Campobello, S.C. there is a church there now that used to be named North Pacolet Baptist now renamed State Line Church. Many Blackwells buried there. They are descendants of John Blackwell. John as he got older moved to live with a son in Walker county Ga. and was buried there. There are many Blackwells related to him as well in Ga. Please contact me, mlenabryant@gmail.com. Thank You. Apparently we have some ancestors in common, I am a James Houston Dillard daughter and he was a decendant from the Dillards (French) that later married Native American Choctaw Chief’s daughter. I have record of five (5) keith’s who fought in the revelution. …but one in particular stands out to me ’cause as being afilliating with the forth reg and being an ‘exchanged prisoner and wounded at Yorktown. …later moving to Alabama! ……but trying to ‘steer you in the right direction my opinion of this ‘John keith is derived from facts I know…on a large bronze sign on highway 8 in Pickens county south Carolina at the intersection of highway 288 is a small town (community) of what is the famous town of ‘pumpkin town, south Carolina. …this sign virtuly tells the story of its founding by a massive ”’clan of keiths. ..they just a river off the boat from Scotland and set up the township of said city (ha ha…at best it’s an old gas station today…but the pumps quit working 50 years ago and never fixed’m back) cause it’s a cafe, small store community gathering place….and it’s in the immediate vacinity of oleonoy community!!! !That babtist church there has many old Graves from the 1700’ ….don’t know where you’re at but would be happy to go take many pictures of all and send to miller/keith family where ever you are.so you may tell your children….I just have a feeling about this! Olneoy and pumpkin town…..means one thing in Pickens county south Carolina. …beauty (the prettiest place in the world!!! )…and ‘keith’s…history in spades….scotch spades that is. !…..it’s a couple of miles from my place……when I see the fields and crystal clear steams….and the beauty full mountains in the distance….I can’t help but think how the decision to raise up a bunch of ‘little ‘SCOTTIES and setup a new homeland was no doubt quickly decided upon…without a doubt those keith’s seen the scotish highlands of the old country right before their eyes only this time without all the oppressive misery of the British crown…truly the ‘Redheaded corn cookinest place this side’a glasscow…an I know that blowed their skirts up!…..cause it still does mine! If you want pictures of all…lemme know! Francis McCorkle served with the Rowan Militia and was to have been present at the battle. He continued his service at the Battle of Eutaw Springs. Are you interested in the relating families of Akins and Barons and Stewarts? Elizabeth McCorkle is related to this line. I failed to mention another 5th great grandfather Uriah Tollison who was at Cowpens, his son was was John and was called “Major Tollison” and collected his pension. I have no record that he served. I have found Uriah’s pension showing his payment. John Blackwell was my 5th great grandfather also.I also had Womack relatives who were called “spys” during the revolution and had relatives Lemasters who served in the revolution but cannot place them at Cowpens. For your Major Tollison, check the Indian Wars and the War of 1812. Both these are less documented and can be difficult to research. A local unit could have been raised during the Indian Wars and this is where John served. Researching local records might be necessary. My 4xgg Lt. Col. John Eager Howard was the Commander of the Continental Line at the Battle of the Cowpens. He received a Continental Congress Medal. He was wounded at the Battle of Eutaw Springs. Yes….and am so proud of these men from all families…My 4gg grandfather George Henry Turner and his son my 3gg grandfather James Turner….fought at The Battle of Cowpens…they lived close by at Pacolet….helped found Buck Creek Baptist Church. James was a scout with brother in law Horse Shoe Robinson which fought the Tories …..both married Headen..Heydon girls. James also fought in the Revolutionary War. Buried at Buck Creek Baptist Church. So Honored! James “Horseshoe” Robertson is my 4th Great Grandfather. I referenced his Revolutionary War pension statement in my original comment. Capt david mcnabb, and his in laws taylor, i think was a leader in this battle. My 4th great uncle was a saddler with the 3rd at Cowpens and Guilford Courthouse. Captain Henry Connelly is was my 4th great-grandfather. My daughter has done a lot of research on Capt. Connelly while pursuing membership in the DAR. Lt. Col. William Washington was my 3rd Great Aunt’s (Anna Shanley) father-in-law. She was married to his son, Thomas Washington. My five greats grandfather, John McClanahan, was one of the few sharpshooters at Cowpens. He was killed in that battle. This is family oral history and verified confirmation is required, if anyone or any agency can confirm, please respond. My fifth great grandfather John Camper under General Stephens went from the headquarters at Cheraw Hills with a detachment to guard prisoners taken at the Cow Pens (Battle of Cow Pens SC, 17 Jan 1781) to Albemarle Barrack 4 miles NNE of Charlottesville, VA. I received this information from the Southern Campaigns American Revolution Pension Statements & Roster. My third g grandfather Titus Finch was a Private in the Light Infantry Company of the Prince of Wales American Regiment and was captured at the Battle of Cowpens. He is listed amongst the prisoners taken 17 January 1781 and received by Joseph Holmes, Deputy Commissary of Prisoners for Virginia. He is likewise listed as a prisoner at Lancaster PA in April 1781, along with the other prisoners from Cowpens, and many others. Titus Finch returned from Captivity to his Regiment in 1783. Francis Tripplet, Major in the Virginia Militia and Commanding that unit in the Battle of The Cowpens, is my ancestor. He is inaccurately identified as “George Triplett” on the Monument at this National Battle Field. I have addressed this error with the Director of our National Parks who informed me that it was, in fact, an oversight and CANNOT be Corrected. Make sense to anyone? 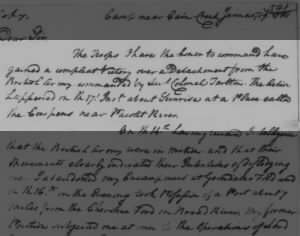 Does anyone have info on the Keen surname in the Revolutionary War? Go to DAR.org and click on “GRS” then click on “Ancestor” and enter “Keen” . a bunch of Keen’s show up, most from Pennsylvania or New Jersey. My 4th great grandfather fought and was wounded at the Battle of Cowpens. William B. Meade. He rein listed in1781October. …moved on to GA. Ohio and I’LL. ..BUT DON KNOW THEORY SPECIFIC DATES…….. WHEN A VERY YOUNG LAD I SPENT THE NIGHT IN THE OLD HOME PLACE OF “HORSESHOE…THE HOME IS STILL OCUPIED as it was back then ‘rented by parents of an old school chum. …local lore accurately depicts this fellow as a very big an burly man…a true gurilla of the contangential army..much more is known of him than one would think! I can take you to the homeplace (less than an hour from greenville) folks still live there although a small marker is present at the ‘edge of the yard….and a casual stroll through the woods a short piece reveals a small graveyard with tombstones denoting “continental soldiers…..several paths of short distance from there to col. Cleavland..and also within 20 miles of general Pickens home where he died…and within eyesight of the ”RING FIGHT in tomasee (salem)..nowhere else in this great country are we more blessed than the Great state of SOUTH CAROLINA…where more battles for freedom were fought than anywhere else in the nation..the old mountain men just set back…an picked’m off…the greatest army the world had seen till that time.took a shore nuff whoopin from a ragtag army that meant business! ..the backwoods men from the upstate here cleared the way for Gen. WASHINGTON TO MOP ON UP! The world was stund ! Truly the events of that encounter was non other than a Gift from God! My 5th great grandfather, John Cunningham had the rank of Major and commanded the Georgia volunteers at the Battle of Cowpens. The sharpshooters under his command were in the first line and inflicted heavy damage on the British. He also served in the Battles of Long Cane, Kings Mountain, and the Siege of Augusta. His name is engraved on the obelisk monument at the Cowpens National Battlefield. John is also my 5th great-grandfather – and I have a great deal of information on the family. My ancestor, Charles Littleton, fought in this battle with the South Carolina militia. Does anyone know of any good reading or resources on the SC militia? Also, he noted in his account that his unit went on to fight the Indians. Anyone know anything about this campaign? Thanks. Fought under gordon/John lisle was in the snow campaign/Florida expidition/battle of stone then with pickens in Camden. ..he stayemmd at cow pens and helped bury the dead then on to N..C. HANGING ROCK/FISHING CREEK/ROCK MOUNT AND OTHER BATTLES SAW HIM COM IN! HE WENT TO EARLES FORT AN STAYED TWO YEARS…AND WOUND UP IN TENNESSEE. AND ALABAMA A SHORE NUFF SOLDIER……YOU SHOULD BE PROUD …..THIS FELLOW COULD MAKE IT HAPPEN! Thank you so much. I had most of that information, but not all of it. May I ask what your source/sources were? Are you related to Charles Littleton? I’m looking forward to more info in the future. I would like to add that the Battle of Cowpens was a successful victory due to a double envelope performed by Morgan on Tarleton’s forces. A double envelope has only been successful in few battles. Hannibal succeeded at Cannae against the Romans performing this tactic. Gen. Greene was almost successful at Guilford’s Court House attempting the same tactic, however, Cornwallis became desperate and fired on his own men as they were intermingled with Greene’s with cannon shot and drove Greene from the field. Greene never own a battle, however, he wore Cornwallis down. There is a great book about his fight called ” Rise and Fight Again”. My ancestor was in his “flying army.” His name was William Ruben Briant. The key was he beat Cornwallis to the Dan River that crosses the between North Carolina and Virginia. Cornwallis had to then dash to Wilmington, N.C. for resupply, because his army was exhausted of supplies, never to return to South Carolina. Morgan clearly was the true heroic leader at Cowpens! Walked Cowpens several times. The geography was perfect for a double envelopement maneuver because the left flank of the British line prevented a flanking maneuver by the British because of the unfriendly swamp land on their left flank. The British were known to quickly hit with a shock and awe then flank the continentals. Morgan knew this very well thus chose perfect terrain as his field of battle. L.S, my name is Piet van Schuppen ( 69) from Holland. I have found a dogtag of an American soldier some 10 years ago.Ever since then I am trying to locate the relatives of this soldier in order to sent back this tag to the right persons, family.Till now I am at the edge of this search but I am missing the last adresses and ask you if you can help me to finish this search. The soldier named Allen S Taylor unfortunately passed away in 1994.His daughter Allena Marie Osborne (71) has passed away on 4th february 2016 in st James Hospital Ft. Wayne IN.I have read this in the Waynesboro Herald on febr. 19 2016 in the collumn Obituaries. Now I am searching for the adresses of her two sons. One son is called Daniel of Ft.Wayne and the other Douglas of Scottsdale Arizona. She also has a sister named Sue E. Garland ( RIchard) of st Thomas P.A. I hope this information can/will help you to make this search to a good end. I hope I “hear “of you! With kind regards, Piet van Schuppen. Welysestraat 32. 6669DK Holland. Thanks for your information about the search of the dogtag family! I hope this will finally lead to the finish of this search! If so, I will let you know of course! You are most welcome. It is very kind of you to return the dog tags to the family, and I will appreciate “hearing” of your success. I just had a Phone call with the sister of Allen. She told me that she has appreciated my intension but she has closed for herself the loss of her father and sister. She will remember him on her own way. On my question if one of the grandsons of Allen would receive the dogtag she could not give an answer. I told her I would leave it this way and stop further inquiery hereafter. Again I will thank you for your help and wish you all the best from Holland! If you approve, I will try to reach Douglas Osborne by telephone and determine if he would like to have the dog tags. I suspect that he would. I would, if I were in his shoes. I have tried to phone him but it was the wrong number . That’s why I have made a call with Sue E Garland. Maybe it is also possible to try the phone number of Daniel of Ft. Wayne as a second try? Surely we don’t give up that easy! I had already tried to find Daniel, but my sources do not list him at Ft. Wayne. I will expand my search. I agree that we should leave no stone unturned ….. I will keep trying and will keep you informed. You have a great command of the English language. Where, when and how did you learn English? Good to read that you also want to go on in this search! As for my language: it seemed on the Higer Grade school that I had a foreign language feeling.This was about some 50 years ago. Next to the English language I sometimes read, write, and speak French and German. Some years ago I started to pick-up some of the Spanish and Latin language. I just could not resist a comment on the American Cemetery in Holland and how families adopt these graves and keep them up, carry flowers there, and each generation is pleased that this is passed on through the family. When visiting in your lovely country while my husband was based in Germany we spent more time there and at the home of the doctor where the English and Polish are buried from A Bridge Too Far. It is truly hallowed ground – both places and your people are so kind to still care. It is true that we still watch over the graves from WW2 and I hope this will last till eternity! We may not forget this awfull period. First, I would like to personally ‘thank you for your efforts! What you are doing is very commendable! Sometimes in this life we have no idea of others actions.let alone intents I did not hear your conversation with this lady .so I don’t know anything….but from what you say…..this is what I feel..and here is why..it’s been a minimum of 70 years since this was left in your country… that means this lady is at least 70 years old (probable85-90) either way that means shes old…you know the the loss that long ago was Deva stating! ..and there ‘really never was any ‘closer…..(notice those were her words…..her explanation closer)…forgetting about it has so far been easier that this ‘closer since after all that’s been impossible….being wore down emotionaly and mentaly till abstinence of thought seemed the only option…simply put Piet. .It’s just been too painful. ..for too long!.Now I have no ides if his sister was a nurse/medic over there with him in the 40’s …or something happened here later…it don’t matter….we see a ‘pattern of thought right there in her way of dealing with loss (I’m wondering if she said what happened to her sister. ..remember they were all brothers and sisters…..) that don’t matter either it just let’s us know that LOSS×2 truly either has been or surly now is…still unbearable with the loss of both (she told. You of the loss of the sister..right? )..Piet ….one of his family if not several will come/contact you with praise about these plates! Rest a sure. ..and it won’t be long neither! I was in thought over your post earlier and just thought..my my what would they give for’m! What would I give for my granpa’s!!. …Taylor was an American soldier…one that paid the ultimate price in line of duty…that’s a debt no American can ever repay…only do the same for the country if fate would dictate…if not much gratitude is due him forever..(every time you see’me. ..tellm).forgetting not one…do you realise we are on this furum concerning Americans that fought the first time!…never seen there faces but love them dear!and slavishly reseach year after year to know there deeds….because if nothing else we have identified their character…attempting 250 years later…to leave no stone unturned….why? cause they are our father’s now known to the world as Americans! ! !…just hold to your guns….and they will contact you!…don’t stop till you place them tags in the greatfull (to you Piet!) Hand where they belong! I feel I speak for many….thank you Piet! A little bit late but thanks for your encouraging message! I really hope we can finally close this long search and hand-over this tag to the right person(s). That could be the last possibility if the this last road stays blocked. I hope it will not be necessary! Maybe it’s an idea that I sent you a picture of the dogtag so you can “work “with it in the search? Please let me know if you have to make costs in this case. That’s a great idea! A picture of the dogtag might enable me to find the U. S. Army Service Records of Allen Taylor. That would be of interest to both of us. I don’t know if you can send a picture of the dogtag via this blog, but if you can’t, just attach it to an email to me at billbate@suddenlink.net. Don’t ever worry about any costs to me. There have not been any, and if there ever should be, I will be happy to bear them myself. I very much appreciate the opportunity to work with you on this interesting puzzle. Also, it might help me to know the circumstances regarding how you found the dogtag and precisely where. Just out of curiosity, where in Holland do you live? Please disregard my last question (Where in Holland do you live?) I just looked back at your initial message about the dogtag and found your home address. Viewed your beautiful home and surroundings with Google Earth (photographed in August, 2016). John was living in Wilkes County, Georgia at the time of this battle, however when he married Ann Davis in Clark’s Fort (thought to be on the SC/GA border) she said after she was married she went to her parent’s home and John returned to the war. Her father and brother, Absolom Davis Sr. and Jr. fought with John but he had moved to GA by the time of the Cowpens Battle. It’s possible it was another battle, but not this one. If my research is correct, Daniel Morgan is my 1st cousin 6 times removed. My 6th Great Grandfather Col. Francis Triplett, commanded the Fauquier County (Va.) militia (as a captain) under Lt. Col. John Howard at the Battle of Cowpens. Lt. Col. John Eager Howard is my 4xgg. I have two I know of disregarding siblings & cousins of said individuals. My mother’s family are descended from John Harris (m. Mary Pickens) & Gen. Andrew Pickens (Mary’s father.) Any descendants of the Harris, Pickens, Calhoun, Irving, Ewing or Handy all share common ancestors that played large roles in the Revolution. My 5th Great Grandfather David James Motley fought in the Revolutionary War for 7 years without ever going home to Virginia. He was wounded at the Battle of the Cowpens. He was in the 3rd Virginia Regiment under Colonel McEntush. He was obviously one of the veteran continental soldiers who made up the last line of defense, which decimated the British general Tarleton. General Daniel Morgan was the 1st cousin of the famous frontiersman, Daniel Boone. Both Daniel Morgan and Daniel Boone were my 1st cousins 7 times removed. My 4GG was Nathaniel Green. My father shared this with me as a little girl but I was only able to verify it through Ancestry last year. Still have a lot to learn. This email was so awesome for me. This is all very interesting to me , a retired USAR Reserve Major. Thanks . I believe my 2nd Great Grand Father Capt. James Wofford fought there and Kings Mt. It wasn’t my 2nd Great Grandfather, it was my 3rd. He did fight at Cowpens, Kings Mt, & Mud Slip(?) He was one of the Spartanburg Five, the five brother who founded Spartansburg. Capt James Wofford also fought at Musgrove Mill, and it was Mud Lick, not Slip. He fought under Col Benjamin Robuck. Any info would be appreached! Just shows you when are United, God was in it! God bless America! And all who fight for our freedom, and justice for all. My research and DNA has show that Daniel Morgan was 2nd cousin to Daniel Boone and first cousin to Nancy Morgan Hart. Contact me at tmorgan707@hotmail.com if you are interested in my 35 years of research into this family. I have descended from James Gilmore and James Lackey of the Rockbridge Rifles. James married his commander’s daughter, Isabella Gilmore Lackey. Gilmore was an old Indian fighter who reminded me of the Mel Gibson character in the movie, The Patriot. James Lackey drew pay in Charlotte before the battle but was no longer present the next time the unit drew pay. My speculation is that because he was not among the dead (there were 2) or wounded, he may have been sent home by Gilmore to give the families of the men news of the battle. It seems likely that he was on good terms with his commander or he would have been forbidden to marry the commander’s daughter. Such interesting postings–I just stumbled across them. Mr. Gravino, my 4th great-grandfather was Joseph Dillard, born 1760 in Virginia and moved to North Carolina & later South Carolina. My 4th great-grandmother was Judith Briant of Spartanburg, South Carolina. She was married to Thomas Reid whose father was William R. Reid who died in Pacolet, South Carolina in 1793. I’m interested if my Joseph Dillard is the one who was in the battle of Cowpens…he did have a brother named James. This is my maternal line. Any info you have would be wonderfully appreciated! Patricia, I would love to know of your Briant info. My great grandfather was William Bryant. Please contact me, mlenabryant@gmail.com. Thank you. I seen your post an had in hand this information….it just sorta fell open to most of it….then some to the floor…these Ole pages are literally Fallin apart!…..I hope this helps you dear…..as far away as the days of these great patriots get…..THE MORE GLORIOUS THEY BECOME! I am hoping all those who responded to this site will consider joining the DAR.org or the SAR–Sons of the American Revolution. Since I retired as a teacher 12 years ago, it’s the best thing I have done in retirement. Each DAR & SAR has a public site with more info. You only have to prove birth, marriage, deaths of each direct-line descendants from your supporter of the Revolutionary Patriot cause. That does NOT mean you had to march or carry a gun. There were lots of ways to serve. DAR is esp. helping to find French Canadian, African-American, and Native American Patriots & Women who served in any way for the American Patriot cause. HI! This is a genuine message to anyone who does have ancestors fighting for our freedom from the Brits. I was just last March issued my National no. for National Society Duaghters of the American Revolution. I, too, am a retired educator, who loves genealogy, & I cannot say enough wonderful things about DAR. Once you begin searching, you will be amazed & so proud to know you had ancestors who were Patriots. My original/entry Patriot was from Concord, NC, an area considered to be a “hot bed” of trouble by the Royal NC Governor at the time. I have 3 more Patriots just from that area I am documenting as “supplemental” Patriots. Many were Scotch-Irish (Brits. gave them/allowed them to settle in “roughest/”worst” land. NC has kept very good records, however documenting actual local Militia who answered the call to go to The Battle of King’s Mtn. & Guilford Court House can be “tricky” to prove participation. In Moss’s book on SC Patriots, he notes the lack of constant record-keeping. Some soldiers were “officially” of The Continental Line. Others answered the call as needed “Militis Dts. ), e.g. King’s Mtn. Many German descent Patriots lived in the Rowan, Burke Co., & Charlotte-Mecklenburg (Concord) area, including Hildebrand’s, Mull/Muell, & Stameys. Scotch-Irish fought with all the will & fervor you would expect from them! Those names (just some of my family ancestors) include Kerr, McMurray, Kirkpatrick, McDowells (OFFICERS; more than one! ; nearby county named for a McDowell); Taylor’s; AND others. East Tenn., by the way, was at the time part of NC (Yes, the high mountains & treacherous topography of the area). All that said, in my opinion (& have heard this of many SAR & DAR members), these are two of the most prestigious organizations a lady or gentleman can belong. SO MUCH is done to honor these by-gone Patriots; DAR does so much to serve their communities…everything from historic preservation to honoring our nation’s most recent vets. ; wounded warriors; USO, support of; recognize Good Citizens & give out high school ROTC awards @ the end of school years; hold ceremonial remembrances at battle sites with SAR & others; celebrate Constitution Week; provide fantastic programs at meetings; and, well I could go on & on as you can tell. NSDAR has a national web site which will give you great information re: the organization. Local chapter Registrars will help guide you through qualification & proofs of lineage. I strongly recommend looking into the possibilities of joining. If you’ve “American Patriotism” “in your soul” & you love history, I’d strongly recommend you check in to NSDAR &/or Sons of the American Revolution. There is always so much to do! Hope I’ve generated interest! Join us as a new member in NSDAR in GA! We have a fantastic STATE REGENT, & she & her state officers & members are encouraging new growth by welcoming new members at all times! You will love it! Documenting for the “call to arms” as one would call it is most difficult. One of the group came out of Augusta co, Virginia… The call went out, they gathered went and fought then went home. No pensions, no militia roll calls etc. My William Given died before the pension act 1832… and apparently did not apply for the Virginia pension (there was a Virginia pension act, another ancestor did apply there), his son Robert Given also served with him. The original DAR application gave a “first hand” accounting of his service… I’m still battling with DAR… he was not a “patriot” (as many of my ancestors were) but a soldier who fought as did his son. Thank you for the positive feedback on two very valuable organizations. See my post to the whole blog. YEAH CAPT. JOHN ASH FOURTH REG….A JOHN JR. IN THE MILITIA…..A ROBERT UNDER HUGH BRATTON WAS IN GA CAMPAIGN IN 78…….A SAMUEL….WITH A CHARM LUTON ARTILLERY OUTFIT…..and a WILLIAM ASH JR…..HE WAS IN A LOTS OF MAURAWDIN””” YOU GOT ANY NAMES ? Yes, thank you for replying. My oldest Ash gr-father is Daniel or A. Ash , born around 1755. Do you know anything about a Theodore Pridemore, Daniel Guthrie, or Joseph Curry around that time? I believe they were all around South Carolina before coming to Va and Ky. Thanks so much. I too found Fold 3 very difficult to navigate so I have not added it to my Ancestry membership. That is where I have found most of my information. When I get hints from other trees I always look to see what stories or pictures they have. I have been focusing on ancestors that were living during the revolution and digging deeper to see if they served. I also enter their names, state, and birthdays in DAR’s website and have found information their. So far I have found 18 grandfathers who were involved. I think the most interesting one did serve at Cowpens. John Wright was a Quaker who moved several times to escape Indian violence. He thought he had finally found peace at Bush River? Meat present day Newbery, SC until the advent of the Rev. War. Apparently fed up with being a pacifist, although in his 50’s, he immediately joined the celebrated fighting group called Thompson’s Rangers as Pvt. John Wright. He was at the famous Battle of Cowpens. His wife, Rachel Wells Wright was a well known Quaker minister and their is a book about their daughter, Charity Cook: A Liberated Woman. So there is a lot of info online about the family. the stockings for his soldiers that he requested. Of course, we KNOW who would have knit those articles, but there is no record of the women-folk doing that. However, YOU may find something that the women did in your sources to assist the War effort, even if they were pacifist Quakers. Let me know if you find anything. I would really encourage you to contact a local DAR, not sure where you are, but DAR.org public site will send you to the closest chapter with a Registrar to assist you in this effort! Thanks for the suggestion. I haven’t read the books about the family yet but that may have more on the women. I know someone in the DAR here in Tulsa who has offered to help me apply and I will contact her with what I have. My ancestor, William Wright also with a Quaker background from PA – lived in York Co., SC and had a brother John – it is through his brother’s daughter’s application for her father’s pension that we were able to prove the service of William. Another John Wright, James, Nathan, Thomas, and Isaac Joel. Does this match. If so, which son and what was the daughter’s name. Give me the DAR no. and I will look it up. I don’t know if anyone joined the DAR using this John but they were living in York Co., SC and migrated to GA after the war. There are so many William Wright’s in Georgia I had a difficult time sorting them, even sending for estate records for two men who served in the war and died in GA in the same area in the same month. That was how I isolated my ancestor since the estate lists made it obvious that ours was the planter (who loved good horses), not the doctor whose library was the bulk of his estate. I am not a joiner if I cannot be active and have hung up my organization shoes due to health difficulties but I am writing a family history and want to offer resources for each – which has been difficult considering I have 11,000 on my ‘blood’ only GED. I even put on out on Ancestry for the first time in 20 years knowing that what I have is correct and hoping to break down some of my brick walls, but so far all I have found are more cousins that will not make the history! I like it. An excellent read and god bless America. …THERES ONLY ONE OTHER ENGLISH WORD WHERE THESE LETTERS COME TOGETHER….AND the latin/Greek word for covenant is ‘brit……….the same for man is ‘ish …….BRIT-ISH. …..the tribe of EPHREIM IS BRITAIN……THE US is the MANNASA tribe!! !……THE CORA NATION STONE IN LONDON IS THE ORIGINAL JACOBS PILLOW……AND THIS IS WIDELY KNOW….THE PROFIT DANIEL SAID IN THE LAST DAYS KNOWLEDGE WOULD INCREASE…DANIEL 12:4…. 4th G-grandfather (Capt. John Files) and the sons, John Jr., Adam and Jeremiah fought in the Battle of Cowpens. Capt. John was commanding officer of Company 4 in the South Carolina Militia while sons served in same company. He was also wounded along with son, Jeremiah during said battle, however, John recovered fully while Jeremiah suffered an arm wound from a sabre strike which never was fully useful thereafter. To all who had an ancestor serving during said battle, I salute each and proud of all who fought against the British! Is there a list of all participants as I have a lot of American relatives who where there during the civil war. It would be interesting to check their names against the list. to Jim Patterson… does the graveyard you refererence, near Greenville, hold 9Nathaniel Vannoy Feb 16, 1740 – 7/26/1835? I have a picture of a historical marker referencing both he and Gen. Cleveland. Do you know of it and is that near? Vannoy is my DAR ancestor and I want to visit Greenville. I REMEMBER SEVERAL CONTINENTAL GRAVES AS WELL AS VERY INFORMATIVE WRITINGS (AT GREAT LENTH TOO) ON SEVERAL HEADSTONES DENOTING IN PRECISE DETAIL THE CASUALTIES ENTERED! ALSO IT BEHOOVES ME (ACTUALY DISGUSTS) ME AT THE CURRENT DISHONOR BY WAY OF NEGLECT SUCH PLACES HAVE SECUMBED TO! THE SIMPLE TEACHING IN OUR PUBLIC SCHOOLS ALONE WOULD PROHIBIT ALL THIS…FOR THE MOST PART!….THIS LITTLE PLOT IS LOCATED ON ‘THE HORSE BRIDGE ROAD OFF U.S. 76 (THE OLD HOME PLACE OF HORSESHOE ROBINSON IS ALSO IN PLAIN VEIW LESS THAN A 100 FOOT OFF THIS SAME ROAD (HENCE THE NAME HORSHOE)…ALSO THIS LONG ROAD FIRST INTERSECTS ON ‘CLEVELAND PIKE ROAD!!! (FORMALY THE OLD PRATHER BRIDGE ROAD SEE THE CHANGIN GOING ON HERE??? ).THE COVERED BRIDGE WAS BURNED BY VANDALS IN 70’ SAN.AND THE BRITISH IN 1780 ..THIS IS ANOTHER REVOLUTION STORY WITHIN ITSELF! AS STRAIGHT THROUGH THIS INTERSECTS ON TO ‘JARRET BRIDGE ROAD TO JARRETS MANOR CROSSING INTO GA….WHERE AN AWFUL MASACUR OCURRED …. an OLD STAGECOACH ROAD IN THAT DAY (JARRET BRIDGE ROAD) LED . ..THE CHEROKEE THERE TO MURDERED EVERYBODY..AND THE DID (ITSELF OPEN DAILY TO THE PUBLIC)..I WAS TAUGHT THIS IN PUBLIC SCHOOL..
GRESHAM BARRET) THAT EVERYTHING ‘WEST OF CHAUGA RIVER IN THE LATE 1700’ ..WAS THE COLONY OF GEORGIA!!!!!!! I FOUND OUT WUDEN NO NEED TO GO TO ATLANTA IN SEARCH OF RECORDS…EVENTUALY I FOUND ‘a FORT MADISON..!!!.. (BUT I FOUND EVERYTHING IN ATHENS GA! A MAKESHIFT CAPITAL OF THAT DAY!!!! )IN WHAT IS TODAY KNOWN AS STEVENS COUNTY GA!!!!! (NAMED FOR THE CONFEDERATE VISE PRESENT ALEXANDER STEVENS…. (DIRECTLY ACROSS THE RIVER FROM OCONEE COUNTY SC! )ALL THIS IS WEST/NORTH OF WESTMINSTER SC IN OCONEE COUNTY….WHERE I WAS RAISED…IT WAS ALL COMMON KNOWLEDGE IN THOSE DAYS….THEN HERE COME THE KNOW IT ALLs. ..REWRITING THINGS THE WAY THey WANTED TO!….MR.BARRET OWNED THOUSANDS OF ACRES OF THAT LAND AND HAD ACTUALY TALKED TO MANY IN THE 20’ SAND 30’S WHO WAS IN THE KNOW….I IDOLIZED THIS MAN BECAUSE OF HIS ATTITUDE TOWARD PRESERVATION AND THE VALUE OF KNOWING WHERE YOU CAME FROM LESS THERE BE NOWAY TO SEE WHERE YOUR GOING!….PROVERBS 29:18 ..WHERE THERE IS NO VISION THE PEOPLE PERISH!!! FEW THINGS AREA AS CLEAR TO ME TODAY…AND CLEMSON UNIVERSITY REPS. CAME TO MY HOME THERE WHERE I LIVED AT THAT TIME IN DISGUSTS I ON OF THE ”FORT (THE EARTHWORKS AND ROCKS AREA ATOP THE BIG HILL DIRECTLY ACRES FROM THE STEEL FISHING PERISH AL MOST AT THE STATELINE…MR BARRET JUST TOLD ME OF A”’FORT THERE (SEE HOW A CUSTOMARY THE CUSTOM BECOMES) ANYWAY ANYONE WANTING TO SEE ANY THING MENTIONED JUST EMAIL ME AT PATTERSONM787@GMAIL.COM AND I’LOL BE GLAD TO SHOW YOU ANY THING MENTIONED HERE IN. Or direct you there JUST REMEMBER MOST OF THESE PLACES ARE STILL PRIVATE PROPERTY.BUT I KNOW THE OWNERS…..I have never participated in any ”posts. Of any kind. ..but have found this to be very ‘FULL FIL ING. …CAUSE LIKE THE BOOK OF ECCELESEASTES SAYS OVER AN OVER….THERE AINT NOTHING NEW UNDER THE SUN…..AND HARRY TRUMAN SAID IT THIS WAY…….THERE AINT NOTHING NEW….THE ONLY THINGS NEW””””IN THIS WORLD….IS THE HISTORY YOU DONT KNOW!!! I THANK MY HOLY GOD FOR THIS PROMISED LAND!!!! !……AND LET FREEDOM RING!!!!! Leonard Bowers 1760-1840, Was at Valley Forge before Monmouth, also Camden, Cowpens, Guilford Courthouse. This sounds a lot like the ending of the movie ‘The Patriot’ with Mel Gibson. Could ‘Cowpens’ battle have inspired that ending? From what my husband & I could determine, the last battle was indeed “Cowpens.”. I think the character was representative of Francis Marion. Just our opinion.